Summary PrivateWiFi is a new VPN service with bugs to fix. Pros • Easy to setup and use. Cons • Doesn't handle activate/deactivating the VPN very well. • Reboots consistently break all internet connectivity on Windows. • No daily billing option. VPN is one of those technologies that is out of reach for many because it requires setting up either a server or a SMB router. The configuration and maintenance of either piece of equipment is easily over the head of many users. Even OpenVPN, which aims to bring VPN to everyone, requires some setup that well beyond that of an average computer user. 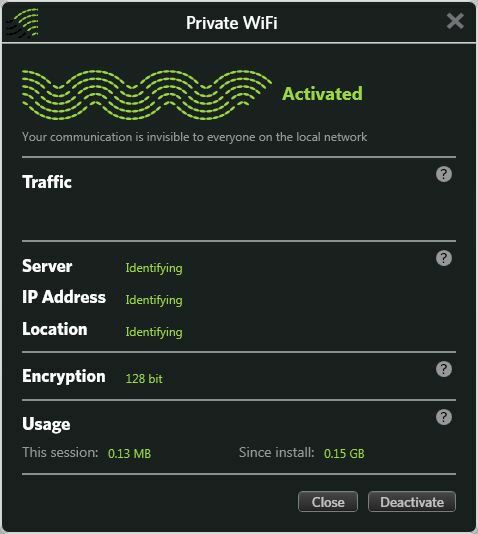 Private WiFi is a product intended to bring VPN technology to the masses by securing your traffic on open WiFi networks. I know that I find myself very often meeting up in a coffee shop with other developers, and conducting business while consuming a tasty beverage. It would be very helpful to be able to secure my traffic in these places, since many times I find myself needing to access resources that shouldn't be accessed over open networks. Not all VPNs are created equal. OpenVPN itself supports at least 30 different types of encryption, from DES to RC to AES. Private WiFi appears to be a somewhat strange amalgamation of different technologies, though. If you browse the FAQ, Private WiFi states it uses 128-bit SSH SSL encryption. I'm assuming this would be SSHv2, since SSHv1 has been deprecated for many years now, due to security holes. During installation, Private WiFi on Windows installed an OpenVPN TAP adapter, which is the tunnel adapter that allows OpenVPN to create the VPN tunnels into an OpenVPN server. In researching OpenVPN, nowhere do I see that it supports SSH for making VPN connections. SSH really isn't designed for VPN, as its original creation was for creating secure interactive shells on *nix systems. So I'm not entirely sure what to think here, and have reached out to Private WiFi for further clarification. I'll update the review when I hear back. Regardless, the account setup is very easy. Everyone can try out the software for three days. After the trial, it's $9.95 per month, or $84.95 per year. The service supports Windows and Mac OS only; there is no cellphone support as of yet. Installation was straightforward, as I mentioned above, installing a new network adapter using OpenVPN's technology. Once installation is done, running the software jumps you through the hoops of activating it on the network. Once activated, you should be able to go out on the 'net. If you take a look in the gallery, you'll see some speed tests that I ran while connected to the Virginia server. The network seems incredibly fast, with speeds on par with my standard 25/25 FiOS connection. I decided then to try disconnecting and reconnecting, to see if it gave me another server, and this is where things got hairy. Disconnecting and reconnecting connected me to the New Jersey server. However, speed tests showed that I was only getting 3 Mbps compared to the almost 25 Mbps I was getting before. I thought maybe NJ was just overoaded, so I reconnected again, and this time went to Missouri. Home screen of the client when it's working. The home screen of the client when it's not working. Connected through the Virginia server, speedtests are quite good to DC. Tests to LA were equally fast, but showed off the fact that PrivateWiFi isn't using the highest tier bandwidth available, or else that upload number would be higher. This only made it worse, with Missouri unable to actually connect. I tried two more times, which sent me to Singapore and then the Netherlands, with no luck with either. I restarted my computer thinking perhaps something got messed up in the configuration. This once again made it worse, as I couldn't even connect to the Internet without using Private WiFi at that point. I found that Private WiFi changes the TCP/IP default gateway in your network adapter. I use static IP addresses so I can easily port-forward things around. So I fixed the issue by manually resetting the default gateway on my connected network adapter. At that point, I could connect to the internet and subsequently Private WiFi, but my traffic was no longer going through the Private WiFi VPN connection. Rather than mucking with the routing table, I simply reinstalled the software. This fixed the problem, which, however, reappeared on the following reboot. I'm going to have to chalk this up as a bug. Users should be able to activate and deactivate Private WiFi VPN as much needed without having to worry about breaking their Internet connection. Access is accomplished entirely through the Private WiFi client. Unlike HotSpotVPN, there is no PPTP access, so mobile phones and other devices with PPTP VPNs can't connect. Support is 24x7 for all users of the software. This includes phone, live chat, and email. Email support has an SLA of 12 hours, which may be a little slow by some standards. But if you need faster support, there are the other two options. There is a decent FAQ section, and the online manual is decent. Honestly though, the software is fairly simple to use, so not much needs explaining. The security policy is somewhat confusing. In my travels, I don't tend to encounter SSH-based VPNs too often, mostly because SSH is blocked on many networks. This is why the move to SSL VPNs has been the hot topic in recent years, since SSL really can't be blocked if you want your network to be at all functional. As I mentioned above, we reached out to Private WiFi for a better explanation, and will update when we have one. In closing, Private WiFi has some things to work on. The activating / deactivating problem only seems to be solvable by completely uninstalling and reinstalling the software, and that is only a temporary fix. The next time you reboot, it's broken again! There are plenty of other VPN options out there, like HotSpotVPN or VyprVPN from GigaNews. So I would give Private WiFi a chance to work out its bugs before I started paying for the service.